Custom Heavy Cotton Canvas Totes Personalized in Bulk. Cheap, Promotional 12 oz. Wholesale Heavy Cotton Canvas Totes, Personalized with Custom Imprint or Blank. Inexpensive, Promotional. Budget Prices for USA, Canada. Bulk custom imprinted 12 Oz. heavy cotton canvas totes in two tones: Natural with 7 different colors of handles and bottoms: very fashionable! We also supply wholesale blank (not imprinted) heavy cotton canvas totes: see the Price Table below, and custom embroidered cotton canvas totes: contact us for pricing. Budget Prices for USA, Canada for premium canvas totes in bulk. American clients pay no taxes. The unit prices below include your 1-color custom imprint on one side, or they are for blank (not imprinted) heavy cotton canvas totes. Add the amount shown for each extra imprint color, per side. You may order any quantity above the minimum. 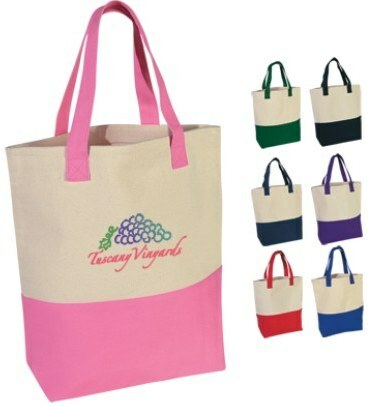 We also supply embroidered heavy cotton canvas totes: contact us for pricing. MULTI-COLOR IMPRINT: Add 0.50 per extra color, per piece. SECOND SIDE IMPRINT: Add 0.50 per color, per piece. PACKAGING 50 per carton @ 30 lbs. PRODUCT COMPLIANCE: ASTM, Prop 65; Also in accordance to standards set forth by the CPSC. Inspection and certification recognized by A2LA.